The arrival of the pour over at the Press Room, Twickenham. 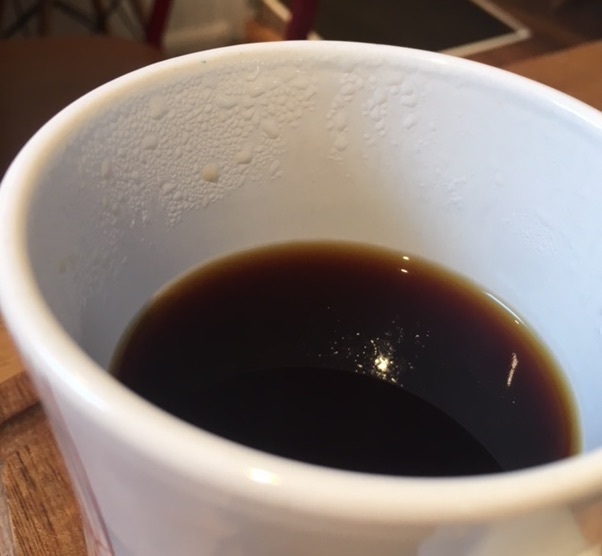 It is not often that I have an errand to run in Twickenham, but when one popped up just two weeks after reading Brian’s Coffee Spot review of The Press Room, it was obvious where we were going to have a coffee. The Press Room serves pour over coffees (along with a good selection of other drinks). 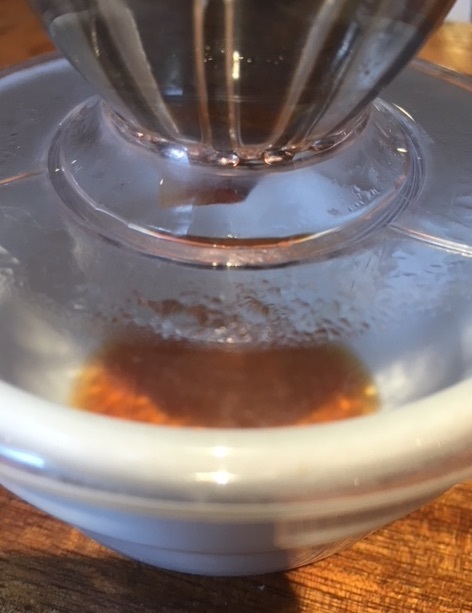 It is always great to find somewhere that serves pour overs well and so I had no hesitation in ordering a Nicaraguan “Los Altos” prepared by V60. Hot chocolate was available as white, milk or dark chocolate and there were a number of alternative non-dairy milks on offer as well as a large variety of tea. A lovely feature of The Press Room is that they offer suspended coffees, the idea being that you buy a coffee now for someone later who may not otherwise be able to afford one. The total number of coffees (given/claimed) is recorded on a blackboard behind the counter. It was nice to see that at the time of our visit 800+ coffees had been paid forward (and just less than 800 claimed), suggesting that the Press Room is having a positive effect on its local community. The large clock on the wall at The Press Room in Twickenham. A great thing about ordering a pour over is watching as the barista expertly prepares your coffee, taking the time to do this properly. To be fair, this is part of the reason that finding a café serving pour-overs is becoming more difficult. 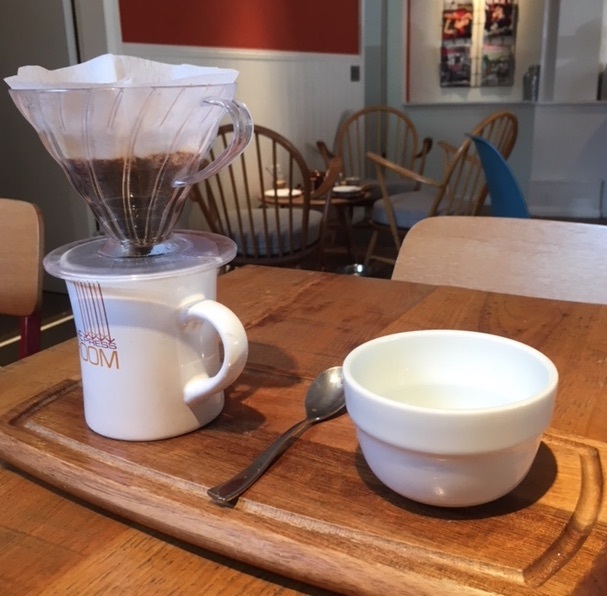 After a while, the coffee was brought over to our table together with a bowl ready for me to place the filter cone on it when I was ready to enjoy the coffee. 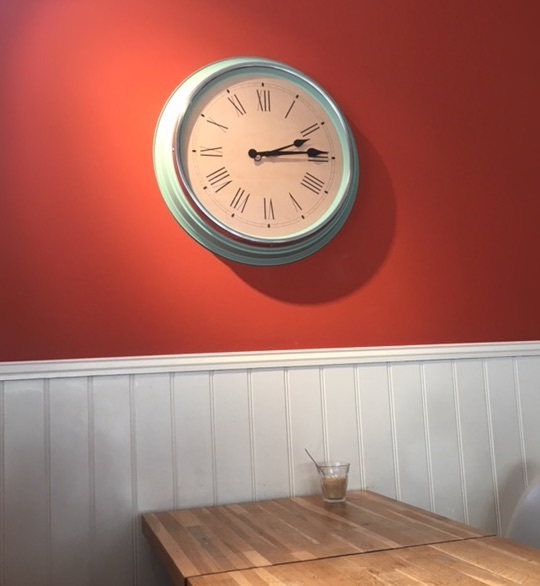 After taking the obligatory photograph, and pondering when would be the best time to remove the filter from the top of the mug and place it onto the empty bowl, the clock next to us took our attention. It is a large time piece that dominates this corner of the room. It is revealing to consider how the accuracy and availability of clocks have changed the way we live as a society. Considering measurement (of time and other things), I used to be in this area more frequently a few years ago when I worked on a project in collaboration with the National Physical Laboratory (which is down the road, on the same bus route that Brian’s Coffee Spot notes takes you to a few good cafés). Partly, NPL’s work is to ensure that we know how to measure things properly. Take the pour over I enjoyed at The Press Room. A known amount (perhaps 12 g) of coffee was weighed out before 200 g of water was poured slowly over the coffee. But how do you know that the 12 g measured at Press Coffee is the same 12 g as you measure at home? And while perhaps it may not be critical for the coffee culture (even the most extreme home-brewer does not need to know the amount of coffee they are using to the nearest 0.000 002%), knowing accurately how heavy something is can be extremely important. Hence the need for a standard kilogram (and a standard metre, second, Candela etc) so that we have a way of knowing that what you call a kg is the same as what I call a kg. The coffee that escaped! But was it a measure of my patience or hesitation? Oddly, the kilogram is the last fundamental unit still defined with reference to a physical object (the other fundamental units are seconds, metres, Kelvin, Amperes, Moles, Candelas). The kilogram reference block is a PtIr alloy kept at the International Bureau of Weights and Measures near Paris. However all this may change next year depending on a decision due in November 2018. If all goes to plan, from May 2019 all units will be defined with respect to natural constants such as the speed of light etc. For the kilogram, this has meant measuring mass relative to a magnetic force generated by a coil of wire in a device known as a Kibble balance. In this way, the kg can be defined with respect to Planck’s constant and an era in which we measured substances relative to known objects will end. On a day to day level though, how much do these things matter to us? Sometimes the way we measure things affects how we view them (and therefore what questions we ask next). Take for example temperature. We are used to measuring degrees of ‘hot’, so on the centigrade scale 0ºC is the freezing point of water and 100ºC is the boiling point. But it wasn’t always this way. Celsius devised his original scale to measure degrees of cold so 0º was the boiling point of water and 100º was the freezing point (you can read more about that story here). It is arguable that changing to measuring degrees of ‘hot’ enabled us to more easily conceptualise the idea of heat as energy and the field of thermodynamics. Certainly for a while, considering the idea of ‘degrees of cold’ meant that some looked for a substance of ‘cold’ called “frigorific“¹. There’s a similarity here with the coffee at The Press Room, was the amount of coffee in the bowl used to hold the filter after I removed it from the mug a measure of my impatience before trying the coffee or my hesitation at testing the coffee? How we ask that question affects how we view the coffee and the café (for reference, I would take the positive interpretation: the amount of coffee in the bowl measures my impatience; I was eager to try the coffee). Condensation on the side of the mug. These droplets can reveal many aspects of physics, which do you think about? Partly this suggests some of the ways in which language, and philosophy, underpin all science. It certainly suggests one further connection with this bright and comfortable café. Erich Fromm in “To have or to be”² considered an interesting linguistic usage that reveals our way of being. Do we “have an idea”, or do we “think”? Are we consumers or people with experiences? Do we wish to have, to acquire, to consume or do we wish to exist, to be. Our language affects how we perceive the world which in turn changes the language we use about it. Linguistically, depending on how we interpret the cafe’s name “The Press Room”, we either have a café that offers a space to read the latest news or one that is reflective of the coffee brewing process (specifically espresso); a space to get up to date or one in which to contemplate? The symbol of the café visible in the frontage of the shop and on the mugs suggests the latter, but maybe it is something we need to experience to truly know?